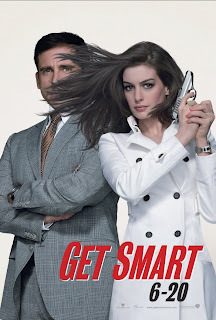 Get Smart is Steve Carell's newest movie, which opened this past Friday. Quite simply, it is his best movie and has serious potential for becoming a classic movie. One that people watch over and over. One that sticks around for a long time. The movie is based on the TV series by the same name from the 1960s, which, I have to admit that I never watched. So I can't comment on how well it represented the original. But looking at it from a stand alone perspective, I can honestly say that this is one of the best movies I've seen in a long time. When I first saw the trailers, I was expecting a movie similar to Johnny English or Mr. Magoo, i.e. the bumbling, idiot agent who manages to get the bad guys by sheer luck. That would have been okay, but it's been done before and I was somewhat apprehensive of watching another movie that followed the same lines. I was pleasantly surprised to find that Steve's character, Maxwell Smart, is, in fact, quite smart and definitely knows what he's doing. He is definitely not the bumbling agent character, which is refreshing for this type of movie. It was hilarious, fun, very entertaining, full of action and special effects, and surprisingly clean. It had a very small amount of language and sexual humor, but it was far less than I was expecting.